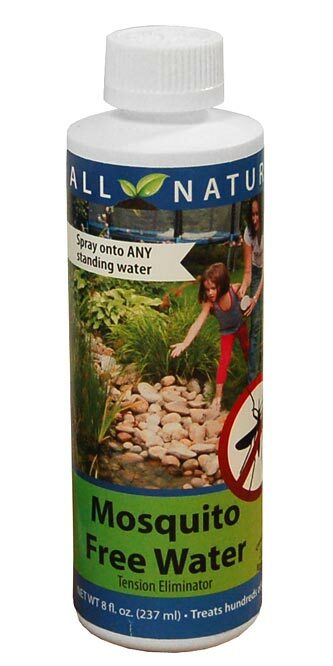 Prevent mosquitoes from visiting the standing water in your yard using this CareFree Mosquito Free Water Tension Eliminator. These insects lay their eggs in areas of still water, and need to land atop the surface to do so. This innovative product removes the surface tension of water, preventing the mosquitoes from landing and laying eggs. The liquid is designed to be lightly sprayed atop the water in your bird bath or rain barrel, and this misting remains effective for up to a week. The item is safe for use around pets, birds, plants, and fish, and may be used in stone, metal, or ceramic bird baths. Eradicate mosquitoes in your area with this Mosquito Free Water Tension Eliminator. Made in the USA.